Candidates who are desirous and eligible REPEAT eligible only may apply through ONLINE mode only after having satisfied themselves of their eligibility for this recruitment. The Candidate must hold, as on 1st July, 2018, a Degree awarded by any University in India, established or incorporated by or under a Central Act, Provisional Act of State or of any Institution recognized by the University Grants Commission or any other equivalent qualification. In the case of a Candidate belonging to Scheduled Castes or Scheduled Tribes, as on 1st July, 2018, he / she must have passed Intermediate or any other examination recognized by the Telangana State Government as being equivalent to Intermediate and should have studied 3 years Degree course. / Distance Education mode are required to have recognition by the University Grants Commission / AICTE / Distance Education Council, as the case may be. Unless such Degrees had been recognized by the relevant Statutory Authority, they will not be accepted for the purpose of Educational Qualification. The onus of proof of recognition by the relevant Statutory Authority that their Degrees / Universities have been recognized rests with the Candidate. Fill up Model (Dummy) Application Form (Part-I) provided in the official website www.tslprb.in which will help the Candidate in filling the Online Application without any omissions, based on the relevant certificates. 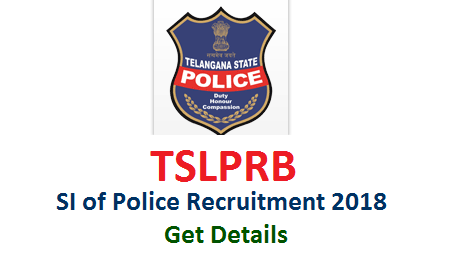 Candidates who are declared qualified in Preliminary Written Test have to again visit the website www.tslprb.in for uploading the Part-II Application along with scanned copies of the following Certificates / Documents.